They say breakfast is the most important meal of the day. I'm no peanut butter and jam girl so making breakfast always requires a little more effort. You wouldn't want to be me if you're always rushing off for work early mornings. Of course, there's always wonton noodles at that hawker stall round the corner or roti canai from my favourite mamak to save the day. How typically Asian of me! 1. Heat oil in cooking pan. Add onions and mushrooms. Add oyster sauce and sweet soy sauce (and a little water if too dry). Do a quick stir-fry, making sure all the ingredients are coated with sauce. Remove from pan and leave to cool. 2. Lightly toast bread in a toaster. Then, place it on a baking tray. 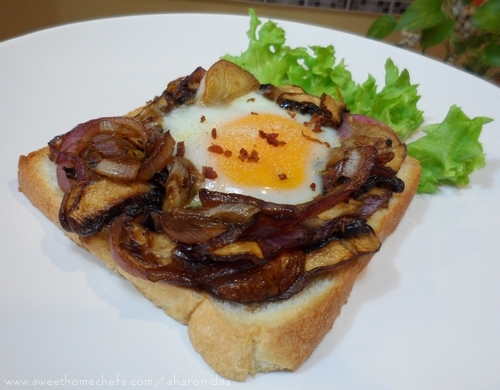 Arrange cooked onions and mushroom in a circle on the toasted bread making a small wall, leaving space in the middle for the egg. Crack egg onto the middle of the toast. 3. Bake this in a pre-heated oven for about 10 minutes at 180C or less (I would watch the oven). 4. To serve, sprinkle salt and pepper on egg. I added bacon bits because I felt like having some.